On a pleasant and mild Winter afternoon, a gaggle of ladies and I assembled in Collingwood for our much anticipated visit to ‘desserts museum’ Sugar Republic. We were all dressed casually (especially important given our impending time in a ball pit!) however alongside my fluro pink sprinkles dress I also wore my fairy floss inspired pastel pink and blue fluffy jacket. Warmly welcomed by staff at the front door, we were given a sticker sheet, and the we travelled past the inflatable banana forest into a pastel coloured, sweet sugar wonderland. 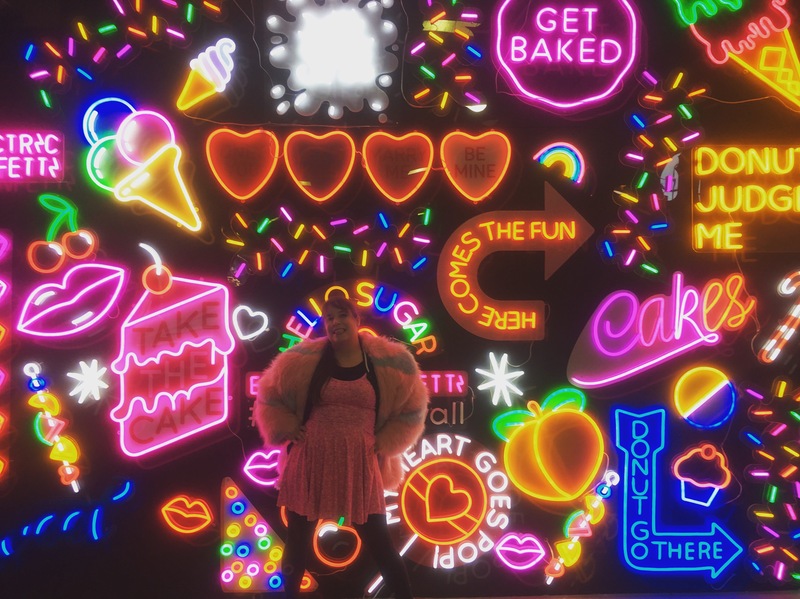 There were treats for all the senses around every corner, and to our delight each room of this desserts / candy paradise was highly instagrammable! 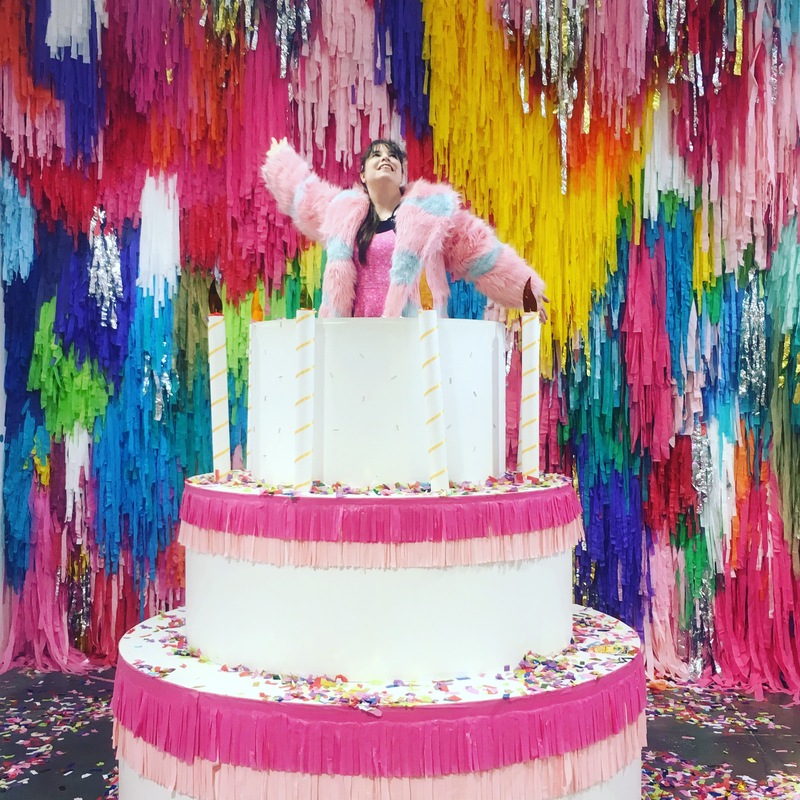 Each ‘room’ or segment of this sugar wonderland was extremely well thought out and curated. 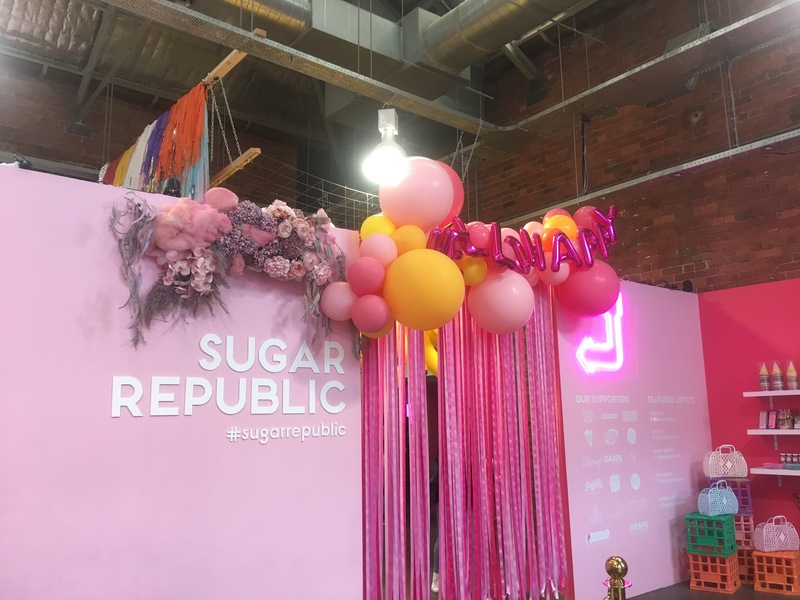 From homages to gummy bears, rainbows and birthday cake, each area made me smile and my heart race with excitement (or a sugar rush!) 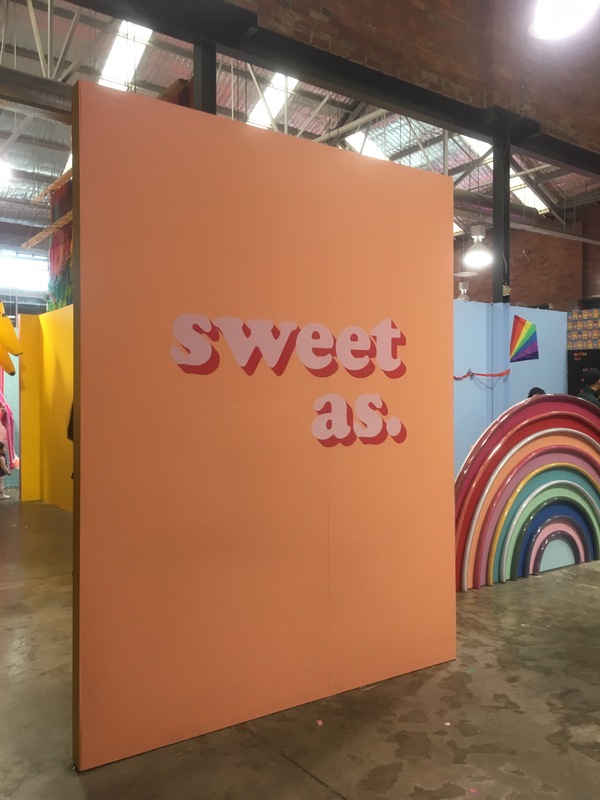 Staff on hand were also extremely kind and helpful – from assistance with group photos, to ensure all us adults had our own time in the ball pit to a staff member helping half our group to get some fairy floss when there were long lines and we got split up. I had envisaged that we’d be overrun with kids and would have to fight to have some time with the installations, however I was wrong – the number of staff on hand to help was perfect and very appreciated. 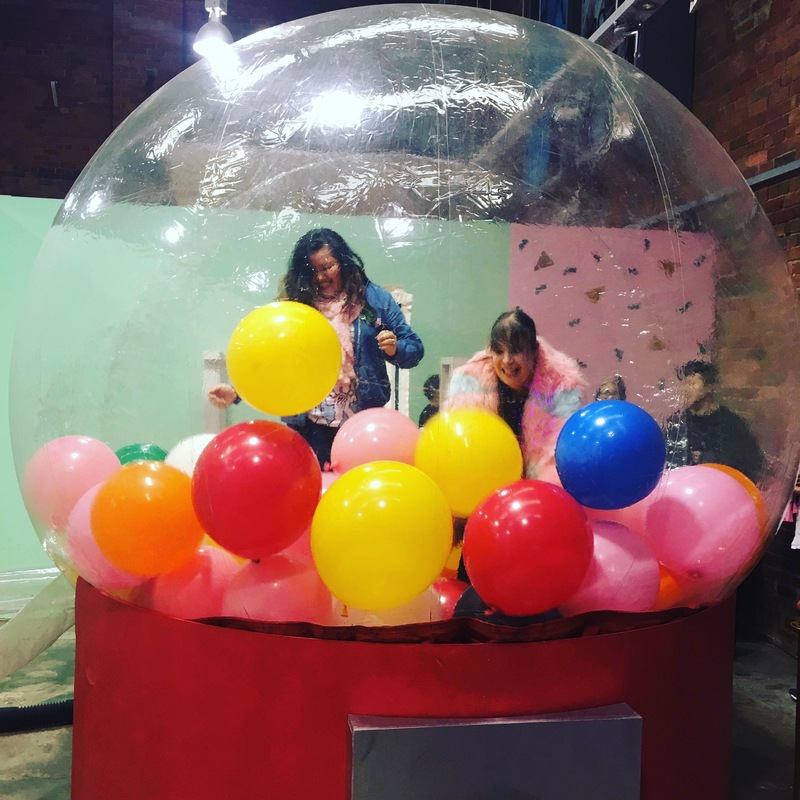 There were a nice mix of activities in the rooms too, so that it wasn’t all a ‘look but don’t touch’ experience – personal highlights for me were the spinning wheel, giant gumball machine, giant birthday cake and ball pit (of course!). 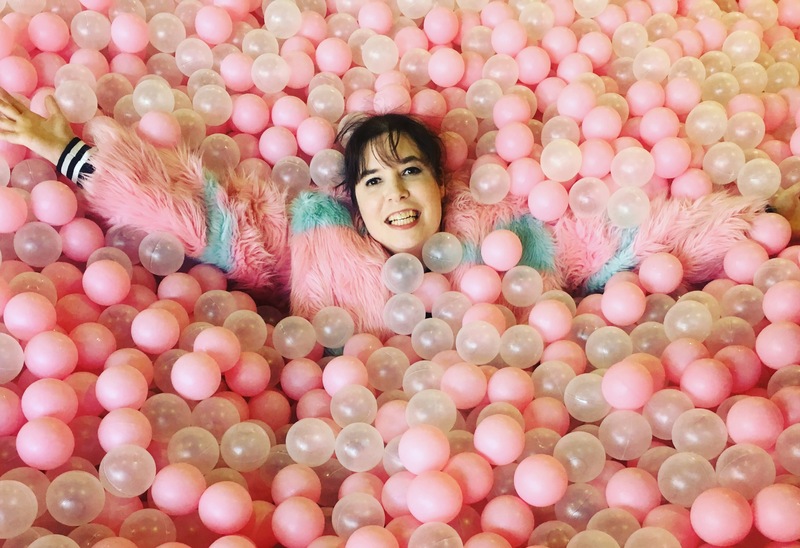 I felt that we were given an appropriate amount of time in the ball pit and we were all feeling a bit tired when we left, which was a good sign. The ticket itself was reasonably priced: for $38 we had an hour and a half to explore all the sweet rooms – a perfect amount of time – and it included an assortment of sweets along the way (including, but not limited to ice cream, fairy floss and wizz fizz sherbet). I wish I could have stayed there forever (cue heart eyes emoji). The experience and laughs / smiles with my friends have left me with many great memories and moments. VERDICT: a sweet pastel paradise for those with a sweet tooth who also enjoy nostalgia. This is one pop up that will sweeten your day!